Congratulations! We are the proud/scared new owners of a real fixer upper. The closing went relatively quickly. I performed my role splendidly – I brought a large check and, without complaint or query, signed every document put in front of me. The check was instantly broken down into smaller digestible checks to feed to all the open mouths (seller, realtors, title company, water authority, school taxes, county/township taxes, attorney’s fees, etc.) – eleven in all! The forms are prosaically wonderful. The seller was a bank, and one would swear that they have a whole department of struggling scriveners dedicated solely to creating the most absurd yet somehow marginally plausible documents. It must be rather fun really. I can picture it now, a head popping up amongst the cubicles, calling out above the din of a sea of fretfully tapping keyboards: “Listen to this. How about a ‘Signature/Name Affidavit,’ which the buyer would of course have to sign (an old joke, but knowing chuckles all around), wherein the buyer would have to certify that their legal name and signature is in fact the signature that they are using at the closing? !” There would be hoots of admiration and approval mixed with those of jealousy, having failed to come up with such a simple, yet obvious, additional form. Some wag might then call out, suggesting an ‘Affidavit to the Signature/Name Affidavit,’ which may get booed down as sour grapes or imitation, yet stored in the minds of many for a more appropriate later date. Check proffered, forms signed, deed recorded. As my realtor said, this may be the deal of a lifetime. I’m thinking it could be the death of me. Either way, I have a feeling this blog could go on for quite some time. The unequivocally good news is that my nephew Evan has arrived from North Carolina. Now that the deed is done, we will start work forthwith. 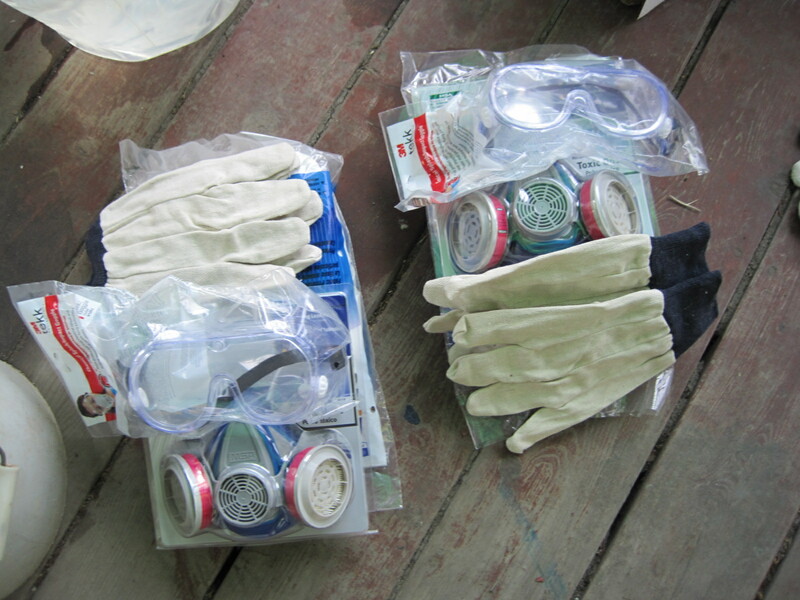 I have purchased the necessary safety equipment, including tyvek suits with hoods, dust masks with mold filters, goggles, gloves, and shoe covers. Let the demolition work begin! Yes, I am still dithering. In the meantime, summer has sadly come to an end. Mowing the lawn is with an eye toward keeping it short for ease of raking. The leaves are starting to accumulate, and I have probably mulched them with the mower for the last time. The rake and tarp (for hauling leaves to the curb) are going to have to make an appearance. The black walnuts are falling in earnest. We have been picking them up for a few weeks now so that they don’t damage the blade of the mower. Despite our previous efforts I still managed to gather over 200 more black walnuts on Sunday. I also still managed to find a few more with the help of the mower blade, which became apparent with the occasional loud bang and shredding sounds. As for the garden, it is sadly on the way out too. 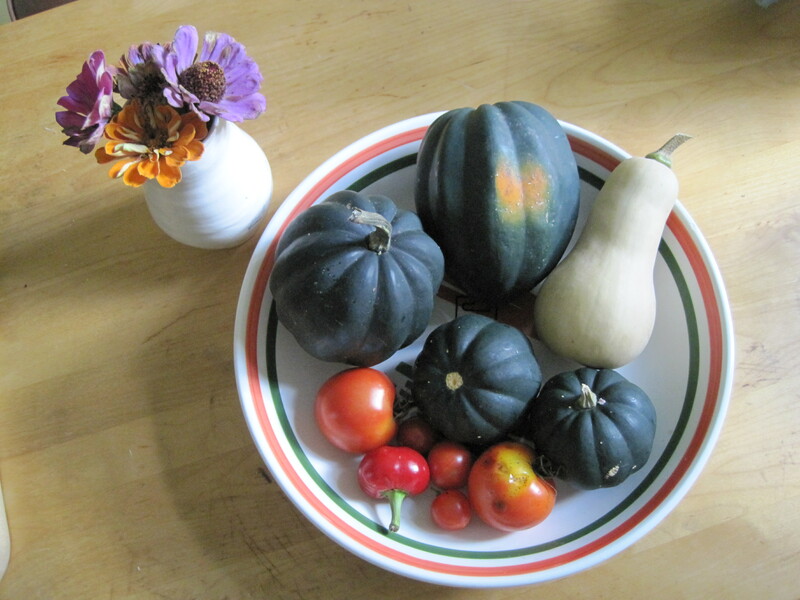 This weekend we enjoyed a ‘fall harvest’ of a few acorn squash and a butternut squash, as well as a handful of tomatoes. The squash are fun, especially since they grew randomly throughout the garden as a result of our ‘not fully composted’ compost (as did some tomatoes). The tomatoes have lost a lot of their flavor, and pale in comparison to the spectacularly flavorful tomatoes of July and August. The sunflowers are mostly done flowering. 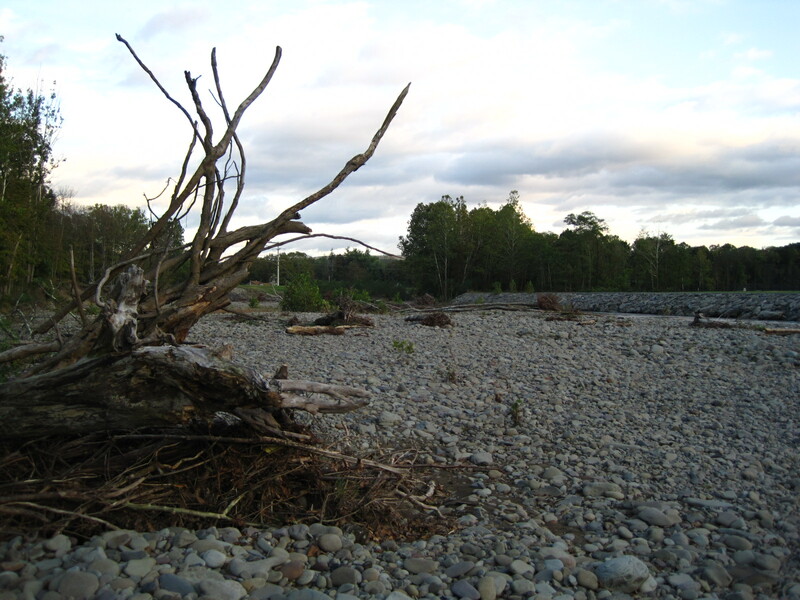 They are, however, leaden with seeds. 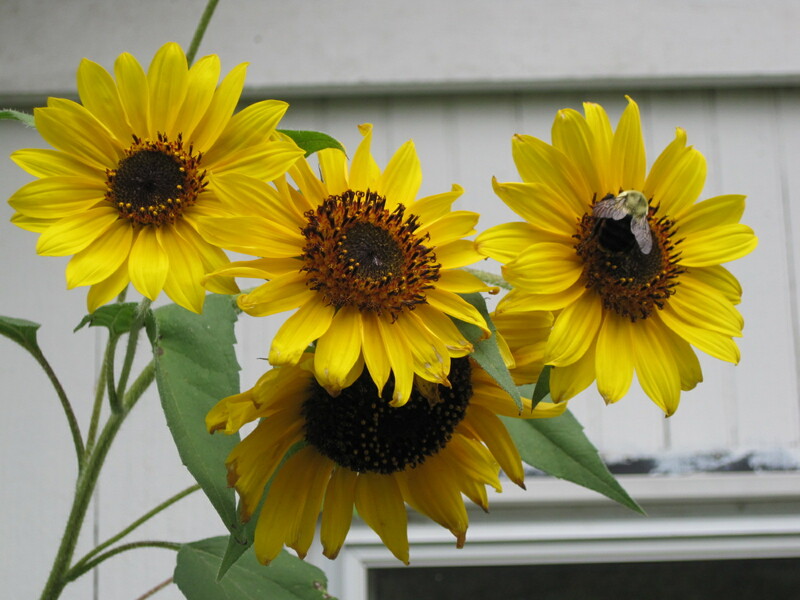 Since we had so many sunflowers, I think that the birds may be enjoying the seeds for quite some time to come. I presume the squirrels will get in on the act too. That should be fun to watch over the coming months. The shining lights still in the garden are the zinnia. The zinnia are great in the summer, with splashes of vibrant color everywhere. Now, coming into fall, they continue to bloom, and there are more on the way. The last holdouts on life in the waning garden. Although we may have recently seen the last of the hummingbirds, there are still some bees listlessly buzzing around and making the most of the pollen. The zinnia have been a real hit with the humming birds, butterflies and bees, but I guess it’s time to put away the humming bird feeder and bring out the bird feeders full of seed. A little walk from the house along the Brodhead Creek brought some more sights of fall. 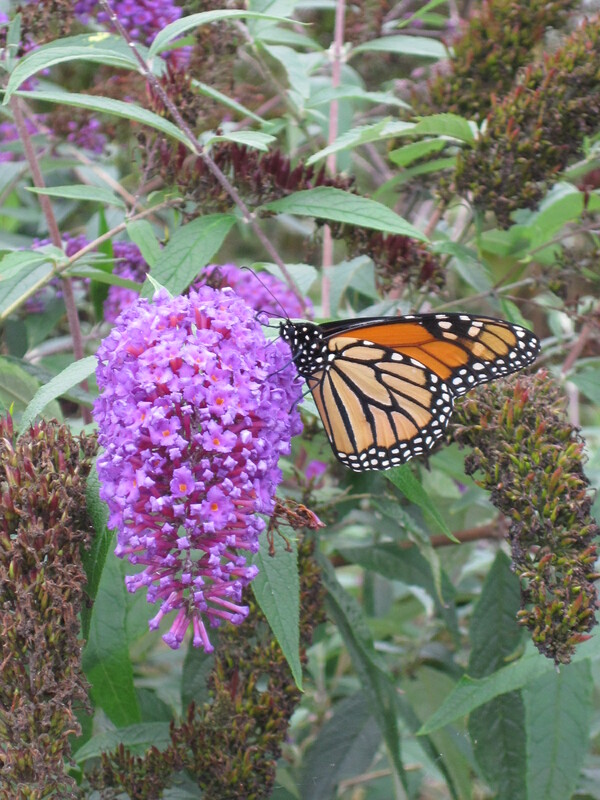 The last of the Monarchs enjoying a clump of butterfly bushes was a very nice surprise. Although most of the flowers are gone, there are still plenty of flowers remaining. The butterflies flitted about, from bloom to bloom. I will have to remember to get some cuttings in the spring. What is happening on the house front? I thought you’d never ask. I continue to fret, of course. I did speak with my brother again about my nephew flying up for a couple of weeks. My nephew is apparently ready, willing and able. Not that my nephew and I have spoken directly to each other about it. 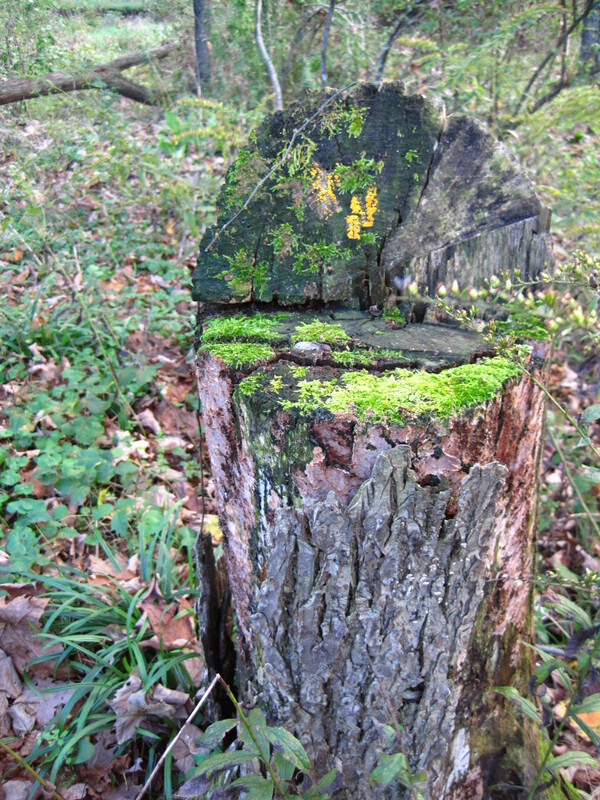 Arrangements such as these appear to be fine left to others. Regardless, I would love to have him visit, and he may be okay with it too. Kismet? Perhaps this new house enterprise may come together after all, despite my reservations.